If you're planning a conference and you'd like to include a more active, out-and-about sort of workshop, then get in touch. It can do wonders to keep delegates awake after the lunch break! 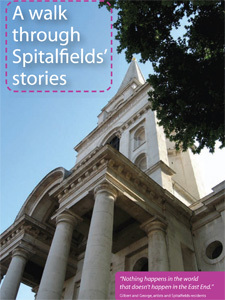 As part of the Tower Hamlets Healthy Borough Conference, we devised 'A Walk through Spitalfields' Stories'. The walk booklet was included in all of the conference packs, and during the day we led a 45-minute group walk around the route. To make the most of the historic character of Spitalfields, the booklet was devised around literary quotes relating to the local area. It drew, for example, on Household Words by Charles Dickens, The Children of the Ghetto by Israel Zangwill and Brick Lane by Monica Ali, as well as local street signs and inscriptions.